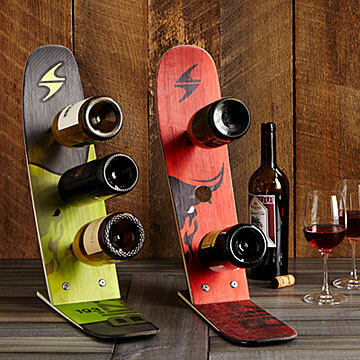 Display and store your favorite wine in sporty style with these unique racks made of reclaimed skis. You don't have to be a wine connoisseur or an expert skier to appreciate this innovative way to display your favorite vino. The bottles are stored on their sides to properly maintain the wine's integrity, while the reclaimed skis, slightly weathered from use, add a touch of fun and excitement. Handmade by Michael Bellino in Millbury, MA. Due to the reclaimed nature of the skis used for the item, colors and patterns may vary from the image above. Each wine rack will be unique and different. Love it - he's excited and a big wine drinker so it will be put to good use! Perfect and unique for gift the ski lover! My friend set this up in her back living room and it looks fantastic! Everyone who comes in comments on it and how clever and unique it is... such a great use of "slightly used" skis!! Just fantastic!! My Dad loves it, cant ask for more. Definitely Plan On Buying More! Bought this for my boyfriend's apartment as we are both ski enthusiasts. I wanted to get him something unique for Valentine's Day other than the stereotypical chocolate. He loved it and gets tons of compliments on it! His brother actually bought one for himself after seeing the wine rack! As is true of so many Uncommon Goods products, the value is in the uniqueness. The quality is good, but they are gift items, with most not being things I'd splurge on for myself, feeling they were a little too extravagant or impractical. Perfect for the kitchen counter, doesn't take up too much space. Looks incredibly cool and is super unique. I bought this as a gift for friends who recently purchased a ski house. A unique gift for the right person. I was so scared that our rack would be made from those red Atomic skis that every kid in America has as rentals, but ours just arrived and it is made from beautiful gray and green skis that I love! I am so excited to give this to my husband for Christmas for our mountain condo. He's dreamed of having a place in the mountains his whole adult life and now that we finally have one, I am trying to find some special pieces for it. This is definitely one of them. Thank you!